From splashing around in a tub full of bubbles to jumping into a pool on a hot summer day, kids of all ages love the water. It is important for parents to be aware of the dangers of water for children and to implement children’s water safety practices whenever their child is in or near the water. The following are a few tips from FastMed about water safety for kids, which every adult should know. What Are the Dangers of Water for Children? Sadly, drowning is the leading preventable cause of death for children between the ages of one and four. Children under the age of one are more likely to drown in small bodies of water around the home, such as a bathtub or even a bucket. Most drownings involving children between the ages of one and four occur in pools, while drownings in children over the age of five typically occur in natural bodies of water. Enroll your child in age-appropriate swim classes. Teach your children to ask permission before swimming or playing in any body of water and to always swim with a buddy. Put all pool toys away when not in use so that they will not attract kids to the water. Remove ladders and any other objects that a child could use to climb into a pool. Keep pools and hot tubs covered when not in use. Empty all plastic wading pools and buckets when not in use. It is also a good idea to turn them over or store them in a place where they will not collect additional water. Install a fence around the pool with a gate that automatically closes and latches. Invest in an alarm system that can alert you if your child goes outside or in the water. Teach children to stay away from pool drains and suction fittings. Be alert to any sign that your child is having difficulty breathing since it is possible for the chemicals used in pools to exacerbate asthma and other breathing problems. Teach your children that swimming in a pool is not the same as swimming in a natural body of water where there are currents, uneven ground, and the potential for dangerous objects to be under the surface of the water. Enroll in a CPR class so that you will be prepared to act in the event of an emergency. To ensure water safety for children while boating, make sure that everyone wears a Coast Guard-approved life vest that fits snugly. Of course, the boat operator and any adults responsible for watching children should not drink alcohol while boating. The issue of water safety for kids is also important inside the home, especially if you have curious toddlers around. Never leave a child unattended in a bath or allow yourself to become distracted by trying to multitask during bath time. Keep your toilet seat lids closed. You can also add latches to make it difficult for little ones to open the lid. Reduce the risk of scald injuries by installing temperature regulators on faucets and lowering the temperature of your hot water heater. FastMed is committed to improving the health and safety of the communities we serve. That is why we are conducting free pool safety presentations for schools and organizations located within three miles of any of our Arizona clinics. The program is designed to educate children and parents about water safety. Children are taught how to swim, along with safety essentials, including never climbing over a pool gate, always asking for permission to go into the water, and staying away from drain and suction outlets. Parents are taught basic “water watcher” skills, such as avoiding distractions, updating CPR skills, and the importance of checking the water first if a child should go missing. 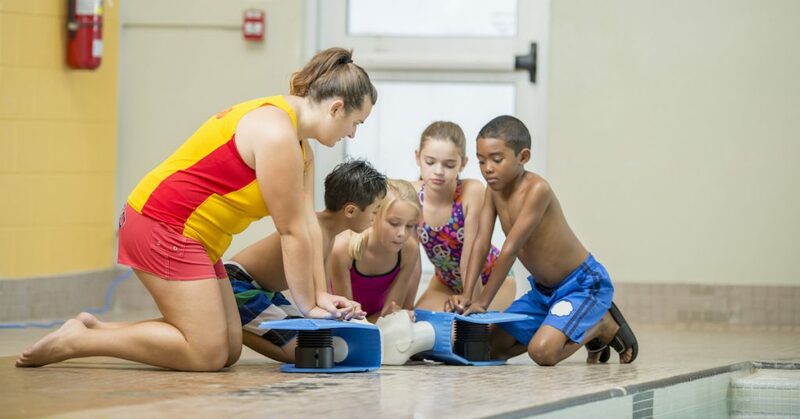 Contact FastMed today to find out how you can schedule a water safety for kids program at your school or organization or to find a program near you.